Your purchase of Fair Trade Certified™ New England® Coffee gives farmers a better price for quality products that improves their lives and protects the environment. This Fair Trade set includes one 2.5-oz. bag each of our Central Highlands Blend, French Vanilla and Hazelnut Crème coffees. 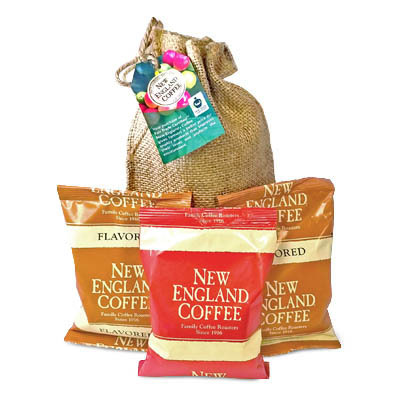 For the very best flavor, brew New England Coffee using a filter or drip method. We suggest 2 rounded tablespoons of coffee per 12 ounces of water. Adjust the exact amount of coffee to suit your taste. Use cold, fresh water and brew according to your brewing system instructions. Each 2.5-oz. package has been pre-measured to brew one 12-cup pot of coffee. I’m a truck driver and have tasted coffee all over the US. I bought a bag (actually 3) of New England coffee, blueberry cobbler , cinnamon hazelnut, and chocolate cappuccino. Have to say Awesome product, very impressed with quality and flavor. Will be coming back for more!!! So I stumbled across this coffee at a gas station in Polk City Florida sucking fumes trying to make it to Orlando late at night. What a happy accident! There was a fine selection of flavours but barre none this is the best coffee both my boyfriend and I have ever had. We bought a couple bags at Walmart before I returned to Canada. I’m here to see if I can order the flavors I liked. Fyi…In a dedicated tea drinker now converted at 38 yrs old. Xox. Thanks for the great coffee.